If you followed our Smallville site, KryptonSite, or are a regular visitor to our Arrow site, GreenArrowTV, you’re probably already familiar with how we like to make compiled, dedicated spoilers pages for is known or rumored for upcoming episodes. Admittedly, we haven’t always been the best at keeping this particular page updated, but we’ll work on that. So now… let’s have it: Details about upcoming episodes of The Flash! Keep in mind that plans and details sometimes change, and that FlashTVNews never intends to ruin the show by having a spoilers page. When new spoilers are known, we’ll try to update this site as often as possible. Please do not reproduce spoilers and content from FlashTVNews; instead, just place a link to the site. If you have any legitimate spoiler tips, please e-mail them our way! You will remain anonymous. 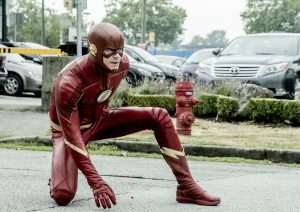 Official CW Description: THE ULTIMATE SHOWDOWN — When Gorilla Grodd (voiced by David Sobolov) attacks Central City, Barry (Grant Gustin) and Team Flash find themselves teaming up with an unexpected ally to defeat – King Shark (voiced by David Hayter). However, when they hit a snag, they bring in Dr. Tanya Lamden (guest star Zibby Allen) to try to reach the man behind the shark, Shay Lamden (guest star Dan Payne). Stefan Pleszczynski directed the episode written by Eric Wallace & Lauren Certo (#515). Original airdate 3/5/2019. CHECK OFFICIAL IMAGES FOR “KING SHARK VS. GORILLA GRODD HERE! Official CW Description: THE META-CURE IS READY TO USE ON CICADA — With the meta-human cure ready to use, Barry (Grant Gustin) and Team Flash must figure out a way to subdue Cicada (Chris Klein) long enough to take it. Killer Frost (Danielle Panabaker) steps in to help with the plan. Meanwhile, Joe (Jesse L. Martin) eases back into work, and Nora (Jessica Parker Kennedy) isn’t happy about the way her dad plans to stop Cicada. Viet Nguyen directed the episode written by Zack Stentz (#516). Original airdate 3/12/2019. -This episode will mark as a short return for Zack Stentz, who worked as a consulting producer back in Season 3, after having joined the show in Season 2 with “The Runaway Dinosaur,” which was Kevin Smith’s first directed episode on the series. – This will mark as Danielle Panabaker’s (Caitlin Snow a.k.a. Killer Frost) directorial debut! – Per Canadagraphs, Panabaker’s episode will be titled “Godspeed,” after the relatively new Flash villain who made his debut in DC Rebirth. While no official announcement has been made, Godspeed will be making his live-action debut in this episode as a TBD actor has been spotted on set in the costume. Photo to your right courtesy of @Brittanyxxoxo on Twitter. – It has been teased several times by showrunner Todd Helbing that a Gorilla Grodd/King Shark episode is being planned for this season. – Keyinan Lonsdale (Wally West a.k.a. Kid Flash) is so far set to make two more guest appearances this season. Like this page? Visit our Arrow spoilers page! – Visit our Flash forum!